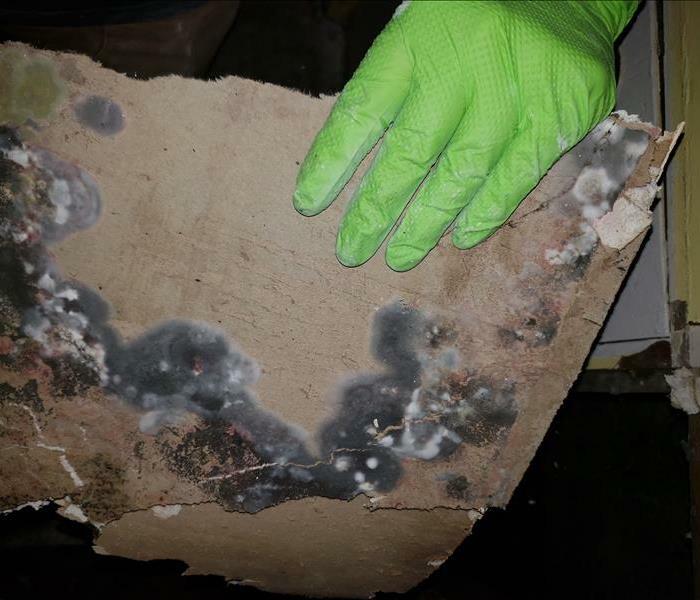 Mold damage at this Bremerton home was widespread. The photo shows a large colony of mold spores growing on the backside of a section of a wall. 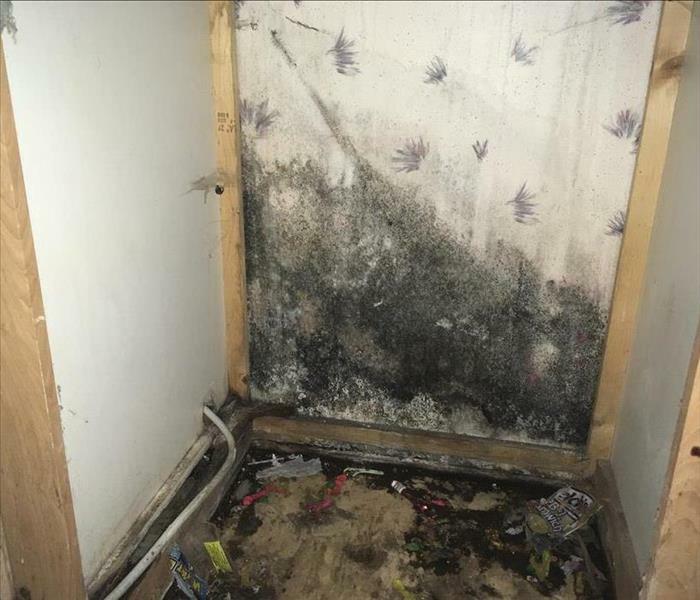 Mold can be harmful to the occupant's health. 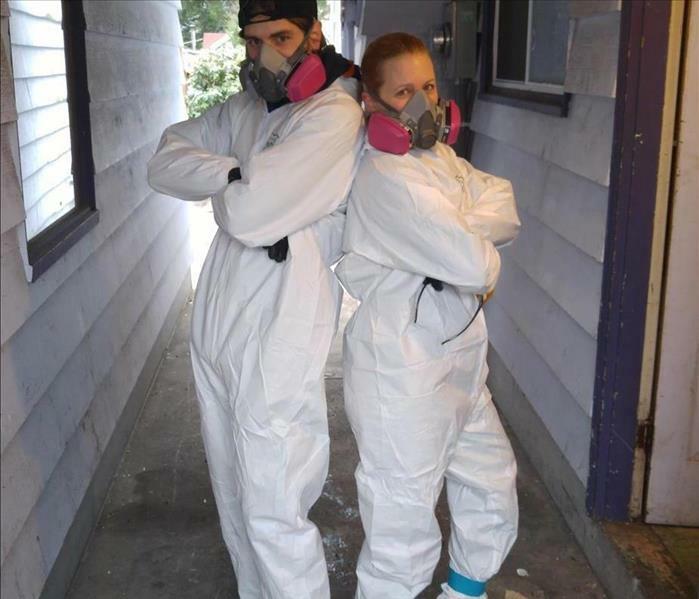 It is essential to have professionals like SERVPRO of Kitsap County with the right gear and procedures remediate the mold damage. 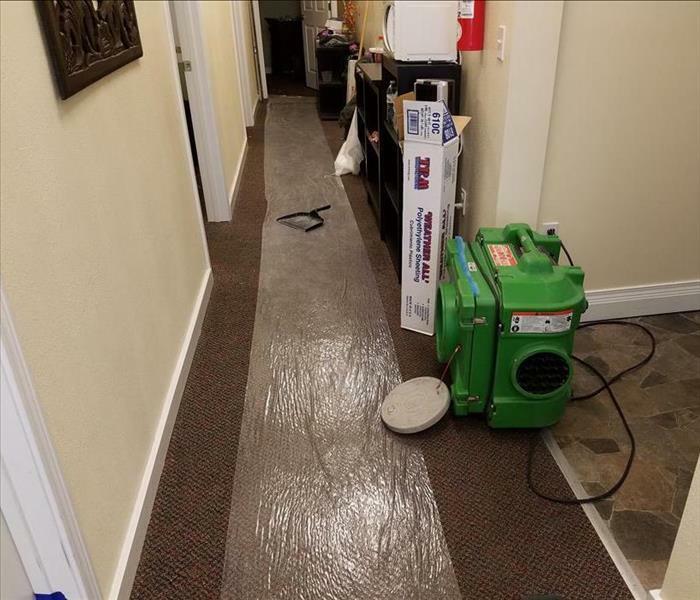 If water damage plagues your commercial property in Bremerton, contact our experts right away! 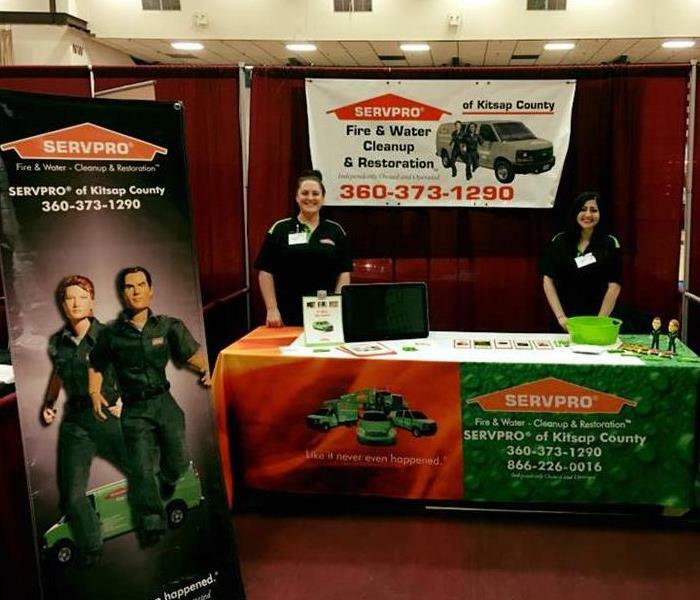 SERVPRO of Kitsap County has the expertise, specialized equipment, and advanced training to restore your property to pre-damage condition. We're ready 24/7 and Faster to Any Size Disaster. 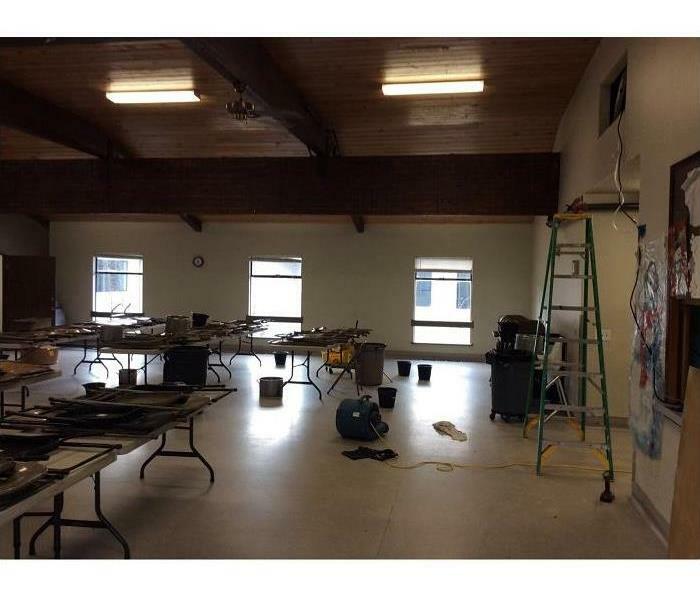 Our SERVPRO Franchise professionals responded to this call to restore water damage at a commercial property. After removing the standing water, we used a special tubing to insert air into the venting system to complete the drying. 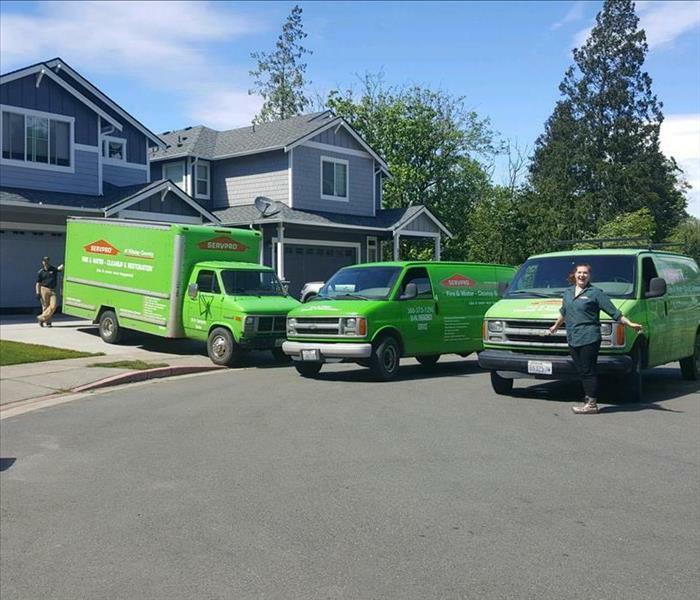 No job is too big or too small for SERVPRO of Kitsap County. We are available 24/7, 365 days per year to handle any water damage emergency. Water damage can occur from a variety of reasons, some internal to the property and some external from a possible storm. 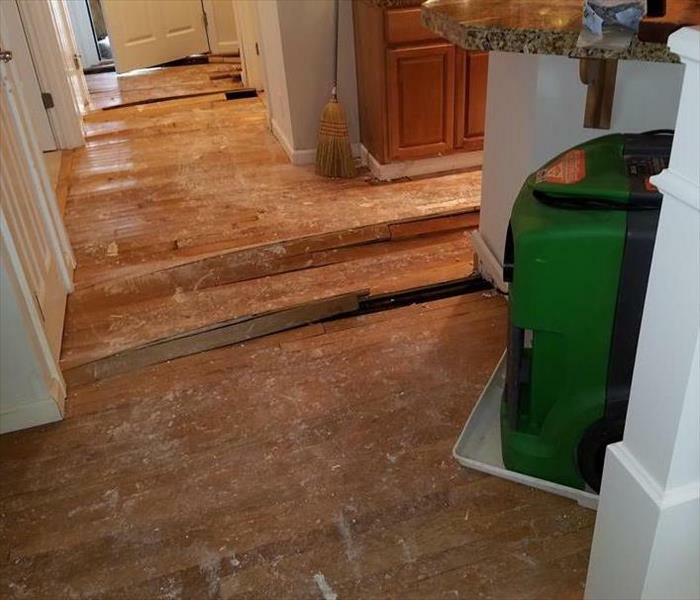 If water damage does occur, you can bet that the IICRC certified SERVPRO technicians know how to efficiently remediate and get your property back "Like it never even happened." Call (360) 373-1290. What do you do when it is Christmas and your roof is leaking? 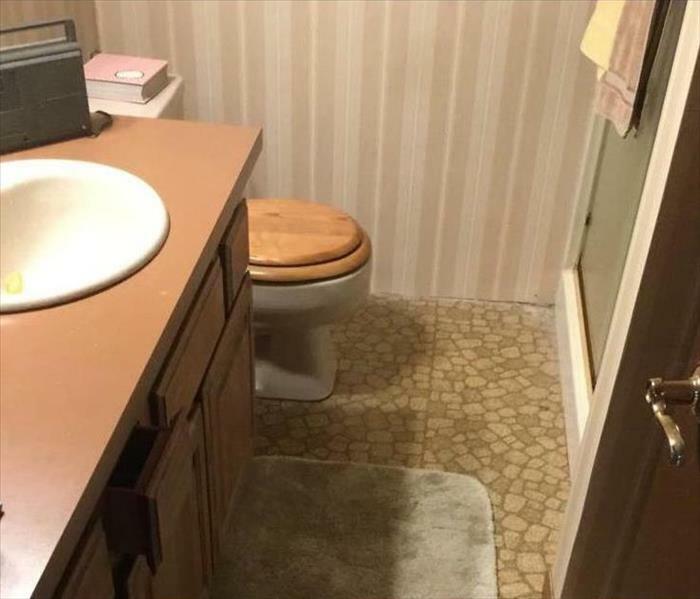 Call SERVPRO as this homeowner did. SERVPRO Franchise professionals can tarp your roof and remediate the damage. SERVPRO of Kitsap County is available 24/7, 365 days a year-even during holidays. We will make it "Like it never even happened." A recent storm caused flooding in this Silverdale home. 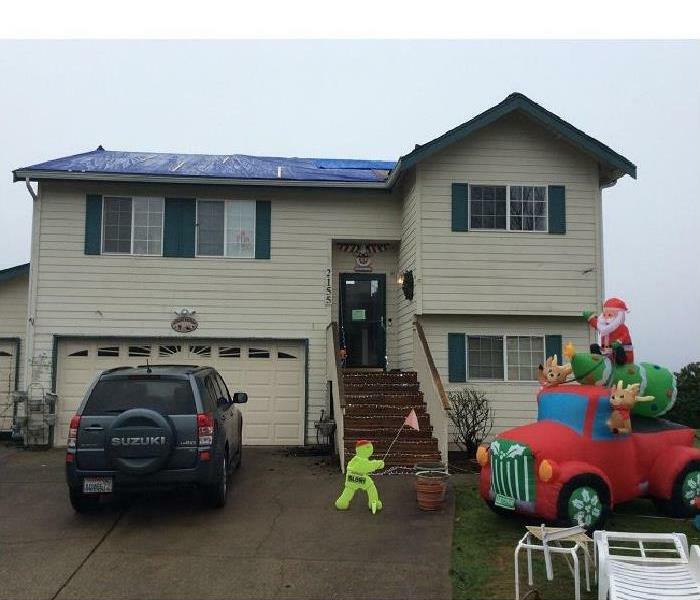 SERVPRO of Kitsap County restored this home to its preloss condition. We are an IICRC Certified Firm, and we continually train to the latest industry water restoration standards. You can trust the SERVPRO Franchise professionals to make it "Like it never even happened." 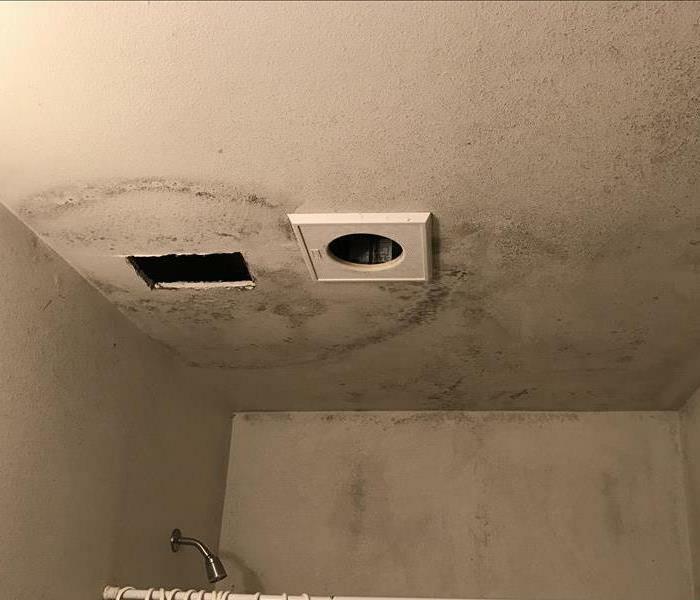 When water damage affects your bathroom, time becomes critical or suddenly you're facing a mold infestation as well. Our satisfied client in Bremerton was able to prevent just such a predicament. 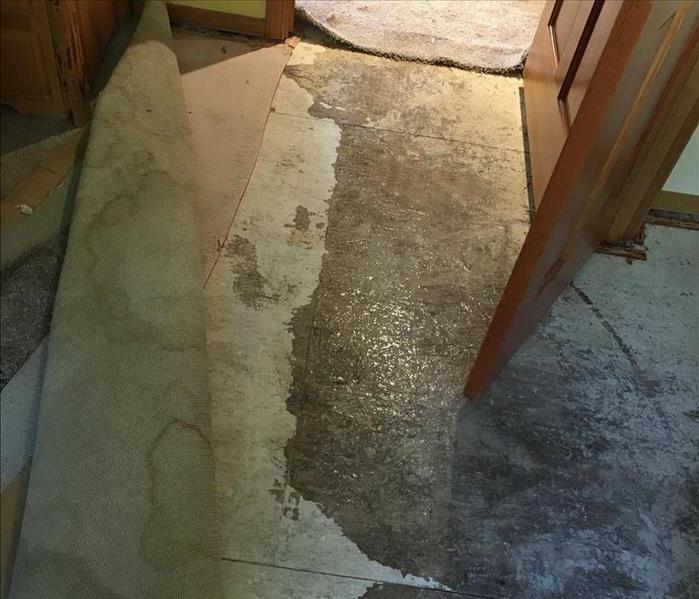 Team SERVPRO arrived quickly to remediate the damage and make it "Like it never even happened." This home suffered from a fire loss. 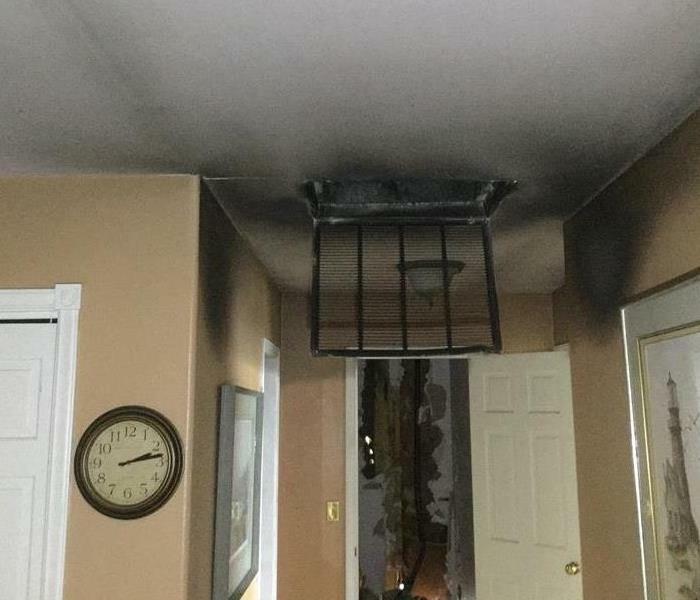 The smoke and soot stained the ceiling and belongings in the home. 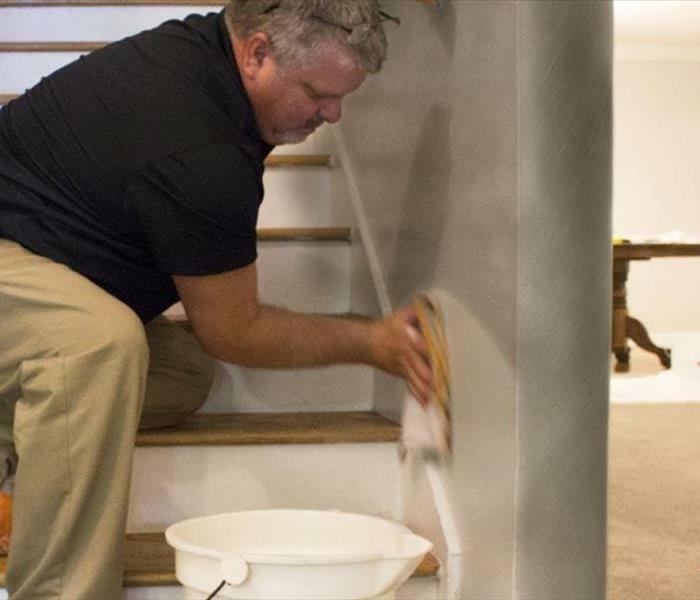 SERVPRO has professional cleaning techniques to remove stains and restore your home back to normal conditions. We got a call on an early Saturday morning for a water loss. When our team arrived on scene, we realized very quickly that we needed all hands on deck. A water line pipe had burst, flooding not just one, but three different businesses in this commercial complex. Thanks to our amazing crew and working together to get the necessary equipment placed after the water extraction was done, we were able to save the businesses and building from a greater damage than anyone anticipated. On Saturday May 19th, 2018 a few members of our staff as well as the franchise owners came together to show support for our military for the Bremerton 71st Armed Forces Day parade, as well as walking in the Poulsbo Viking Fest parade right after. We were so happy to see so many people in the community come out and enjoy the day while celebrating two great celebrations. We look forward in participating in both parades next year as well! This is after the drywall and insulation removal from an affected wall in a customers 1979 home. 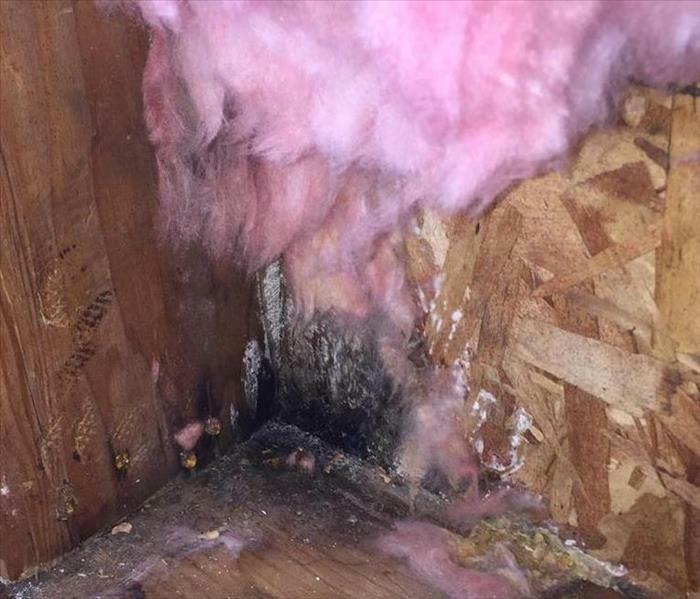 The roof had a leak that had gone unnoticed for far too long, which ended up creating water damage as well as mold in quite a few places in the home. Such as in a bathroom ceiling, the attic, one of the bedrooms, as well as mold damage in the basement. We were happy to help the customer get a scope done and & then proceeded with remediation services. 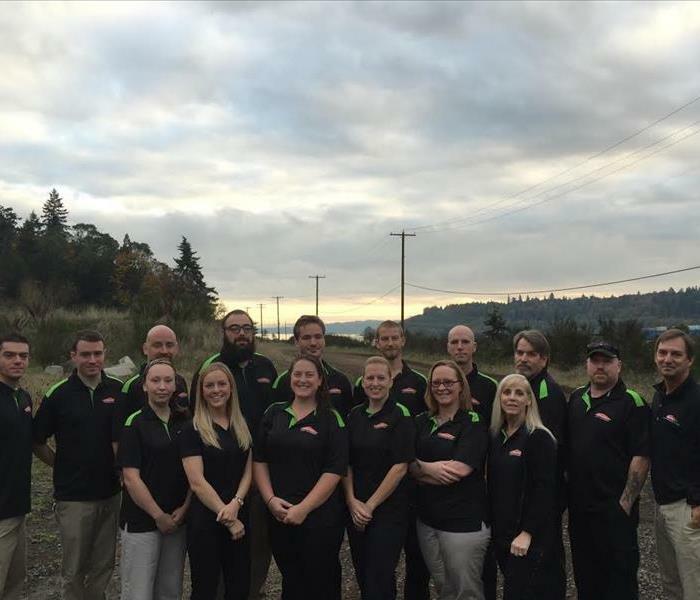 Due to our amazing and experienced team here at SERVPRO of Kitsap County, the customer was thrilled and relieved that they could return to their home with the problem fixed and were able to breath easier and healthier, thanks to our efforts. 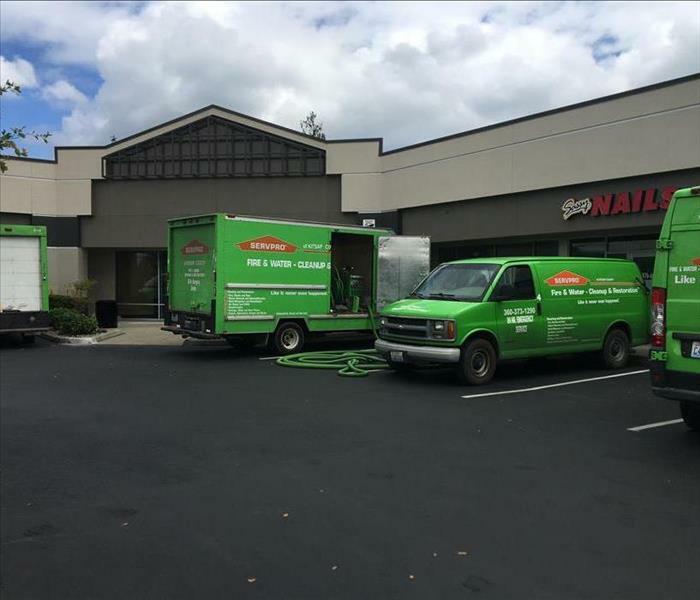 One of our many services that we offer here at SERVPRO of Kitsap County is HVAC and Duct cleaning. And not just residential, but for commercial customers as well. 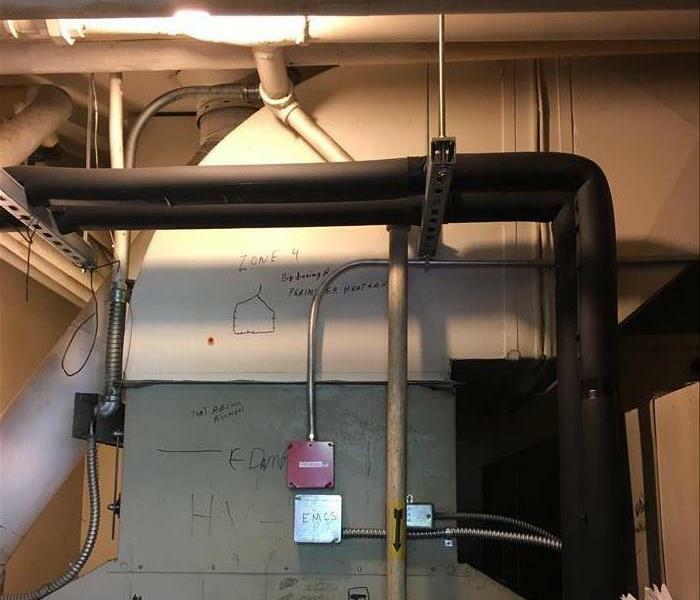 We like to help our fellow commercial entities to have clean ducting. Because cleaner air inside your building can make a world of difference at times for the cleanliness and breathing environment for their personnel and for their own customers too. 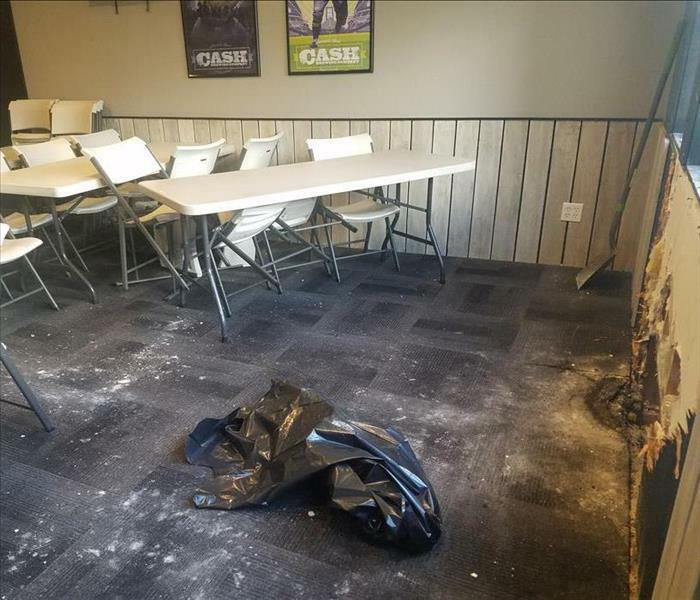 At a local brewery and restaurant, some of the piping caused damage to the area around it when it continuously got too hot. And after so many times, the wood of the structure near the piping decided enough was enough and caught fire. Thanks to the prompt service of SERVPRO of Kitsap County, we were onsite to assist in the clean-up aftermath within an hour. Helping to get the company's banquet room back up and running as fast as possible, and making it look "Like it never even happened." Sometimes you never know when you dishwasher may be leaking. If you notice a small spike in your water, bill that seems out of place, take a look at your appliances that pertain to water usage. 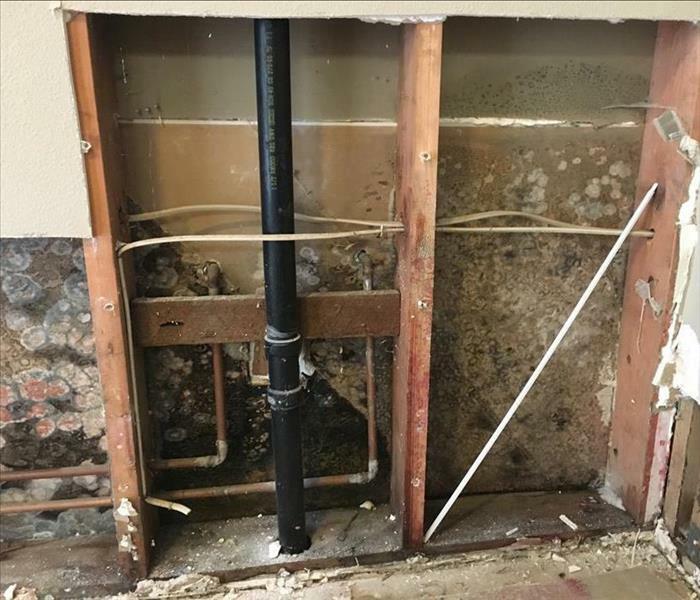 This customer didn't know what had been going on, and found a great deal of mold behind their dishwasher.Thanks to SERVPRO of Kitsap County, we were Here To Help the customer with the mold issue and water damage to make it look and feel "Like it never even happened." In the last week we have been hit by a bit heavier amount of rain then western Washington is used to getting on the daily basis. Causing a large amount of flooding and groundwater to get into homes, crawlspaces and basements. 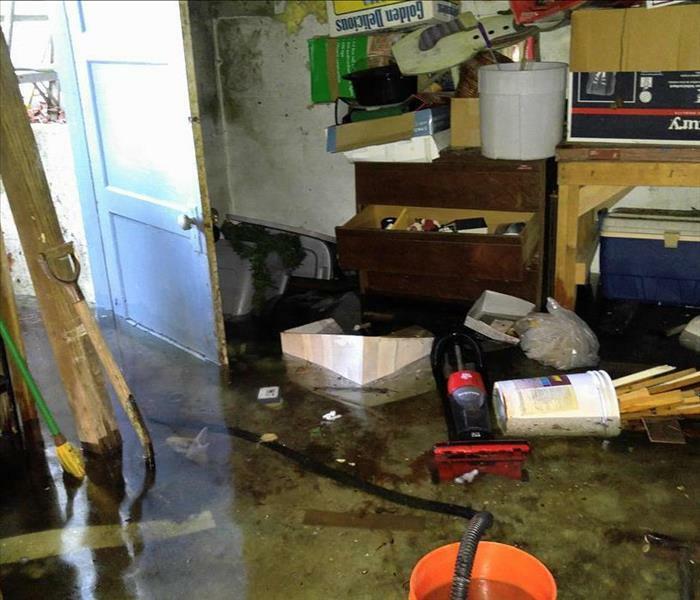 One of our customers had an issue with massive amounts of rainwater coming into his basement. 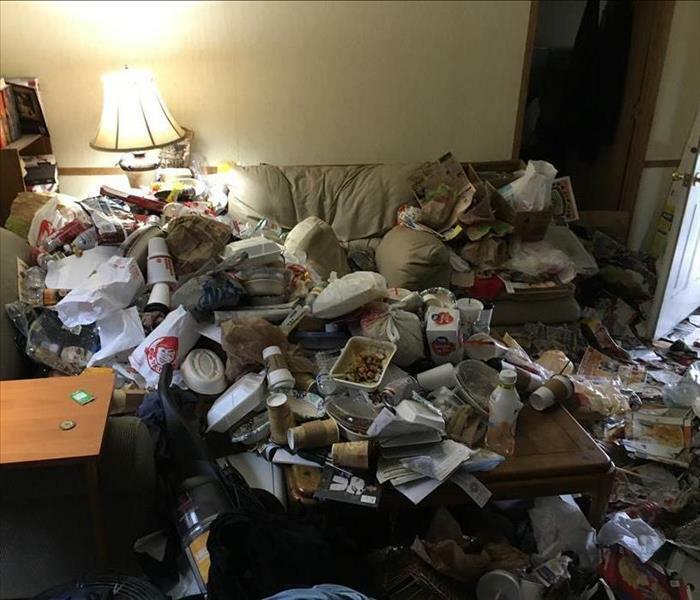 The situation became clear that he had a clogged drain, thus causing the water to collect and fill the basement area and affecting all of his belongings that were housed there. With our top notch extractor equipment and machines, we were able to help remove the water from his basement. And get his structure set up for drying out to get it back to preloss condition. He is getting the clogged drain fixed so the issue does not occur again during the next big storm. When a furnace fire occurs, sometimes the damaged area resides only near the main equipment unit. 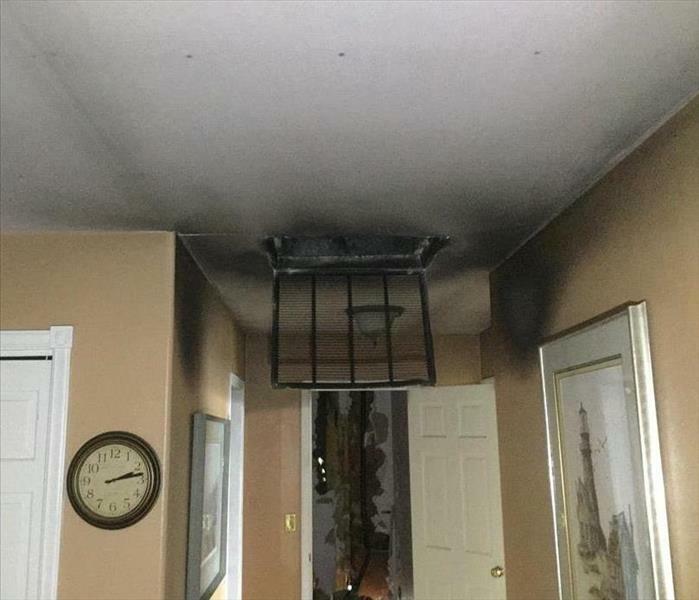 But for this loss, the smoke damage caused from the furnace, traveled across the ducting system in the home. Creating various amounts of soot to get spread around both levels of the home. 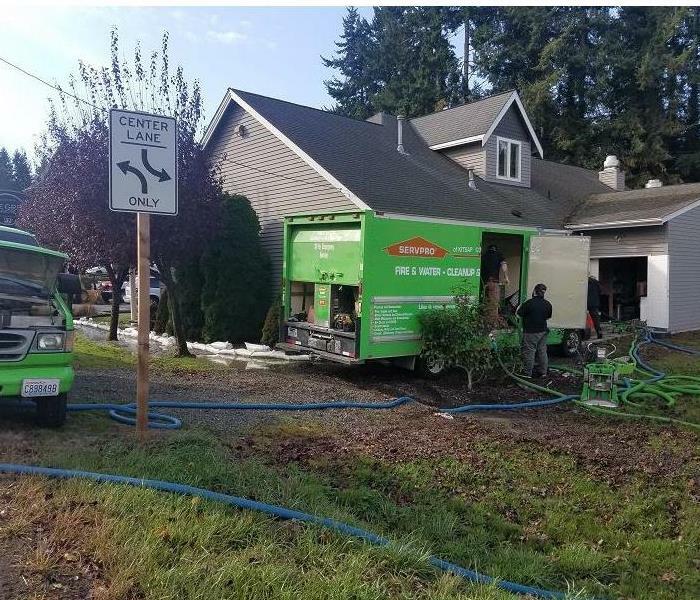 Thankfully the fire team here at SERVPRO of Kitsap County is skilled with cleaning and restoring the home from the soot damage caused. 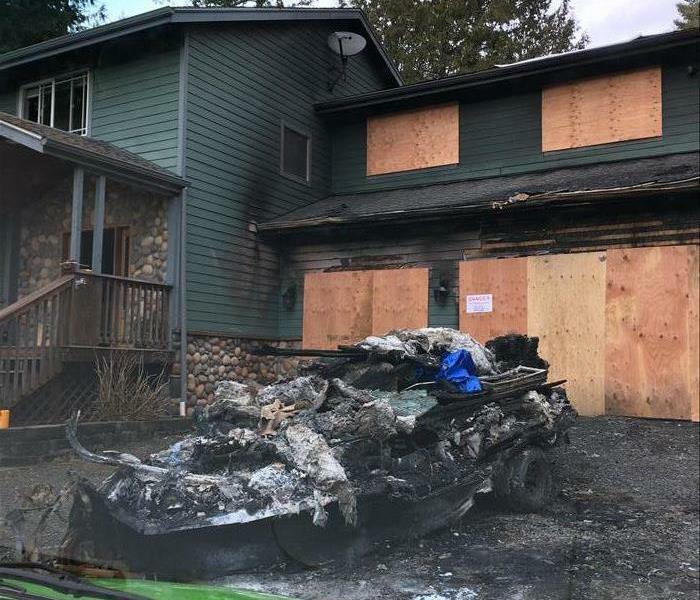 This is the scene that our team arrived at from a residential fire in Bremerton. Out of 5 family members, one teenager was home when the fire started. He has his dog to thank for alerting him of the fire and smoke, causing his to escape the home immediately, safely. We are working diligently with the family and the insurance company for this large loss to get the families home, property and belongings that are not completely destroyed, back to preloss condition. We are glad no one was harmed in the sad event, and are happy that we are helping the family get back to normal as fast as possible. Water main lines can cause a lot of damage if they are hit and broken. We got an emergency call that was a great way to not only exercise but put our extractors to the test. When a water main line was hit, causing all of the water coming through that line to come up from the piping and head straight down hill to a restaurant and retail building, we were called out to extract the water. 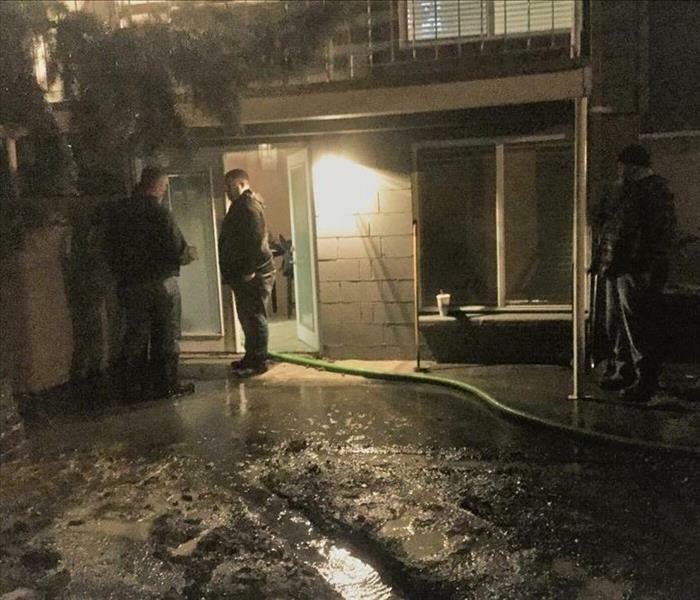 But when we got there, we saw that it was a time test to ensure that the water didn't come up from the crawl space of the building, int the building itself. After many hours of continuous extraction, we made sure the building remained safe and dry, leaving a thankfully and beyond happy customer. When we get a fire loss call, we never know what we will be walking into. When we got a call about a garage fire, stating that there were a lot of contents affected, we knew this was going to be a big job. Thankfully we know what to deem as non salvageable and what can be restored, and documenting every last item into organized manners to inventory anything and everything affected. After combing through all of the smaller items, we had to call in a bigger type of help to remove the larger belongings that were categorized as non-salvageable. 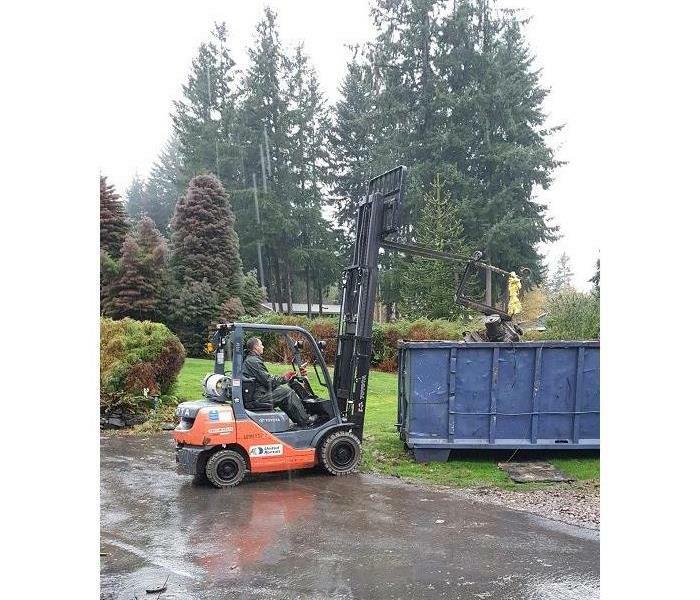 As pictured, one of our franchise owners took the wheel and maneuvered the forklift to help. Speeding up the process time of our crew being on site from job start to finish, and giving a peace of mind for the customer, helping get them ready for reconstruction sooner than they expected and thought. A few jobs that came our way require almost all hands on deck. This job in particular was a water loss that affected almost the entire house. Meaning that a good portion of our entire team was needed to assist not only for placing equipment, but for the demolition of the structure that was too badly damaged to restore. Thankfully in cases like this, the turn around time from initial call to the end of the job is pretty fast. Ensuring a faster than expected time for the home owner to be out of their home and getting their likes back "Like it never even happened." With the recent rainfall in massive amounts and few breaks in between, some homes were not able to stand up to it as well as others. This is an example of such a case where the rainwater was pooling too fast for drainage and had no where to go but inside the home. Thankfully once our franchise got a call from the property management company, our team was able to get on site fast and extract that water and dry the structure back to normal. Our team received a call from a customer for water damage and potential mold in one part of the house. Once we were able to get into the attic, our crew realized that there was roof damage during the last big storm that we had, causing water to get in through the roof and not only affect two different areas of the house, but three. We were able to locate and treat all three areas completely, and remove all of the damaged materials. The customer was ecstatic on our findings and helping realize the importance of checking the roof and exteriors of the home after a storm for potentially unnoticeable destructive causing damages to the structure. 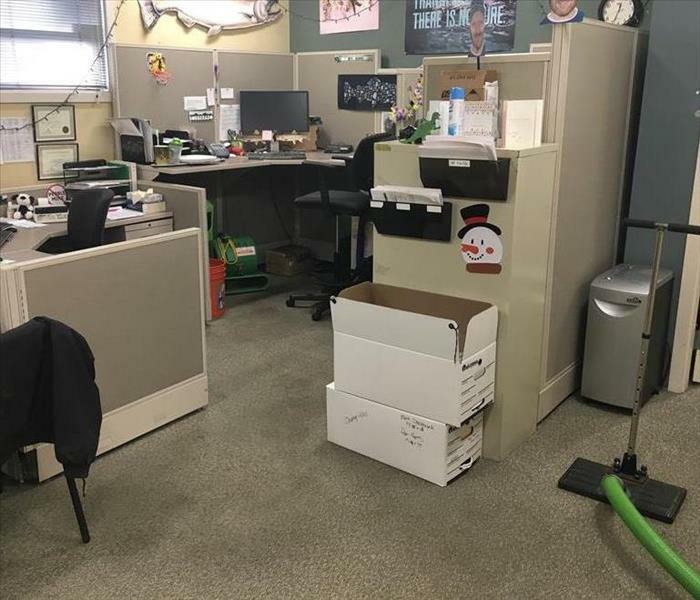 Our SERVPRO of Kitsap County franchise site has been bumped up to the next level of handing even more contents from our customers losses with our new ultrasonic systems and machines. Fireline’s Ultrasonic Cleaning Process, also known as precision cleaning. Using this method of cleaning is especially effective when cleaning items with intricate detail or unique configuration. The cavitation activity produced by high frequency sound waves cleans contaminated items inside and out. When properly applied, this unique cleaning method has proven itself to be ideally suited for restoration applications. In Washington and especially in Kitsap County, we are known to have greenery and vegetation all around, which includes big trees in our landscaping and yards. 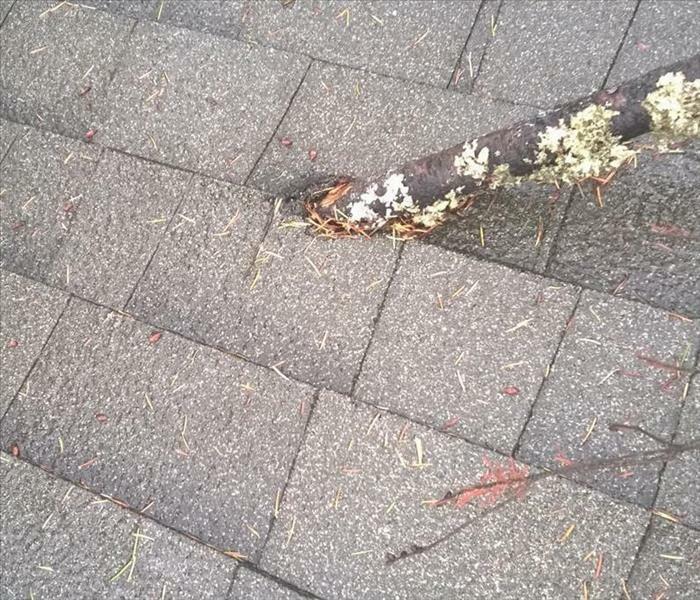 In one of our recent storms, we got a call about a damaged roof from a tree. But it was a bigger job than we anticipated when our technicians arrived onsite to help. The tree had damaged the roof and part of the structure to the home. So much that a structural engineer was needed to come in. As well as calling in for a crane to help lift up and remove the fallen tree, amongst everything else to help with the damage caused. 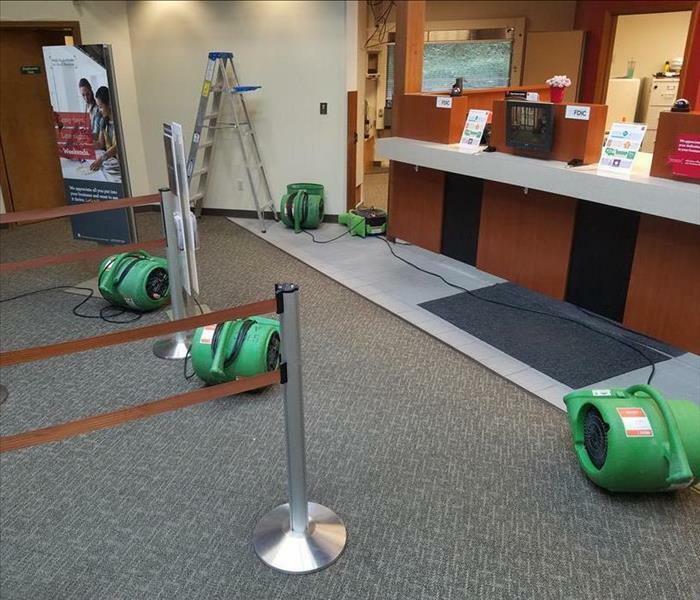 A local bank had a water loss that originated in the top level and came though the flooring and affected the main level of the lobby. 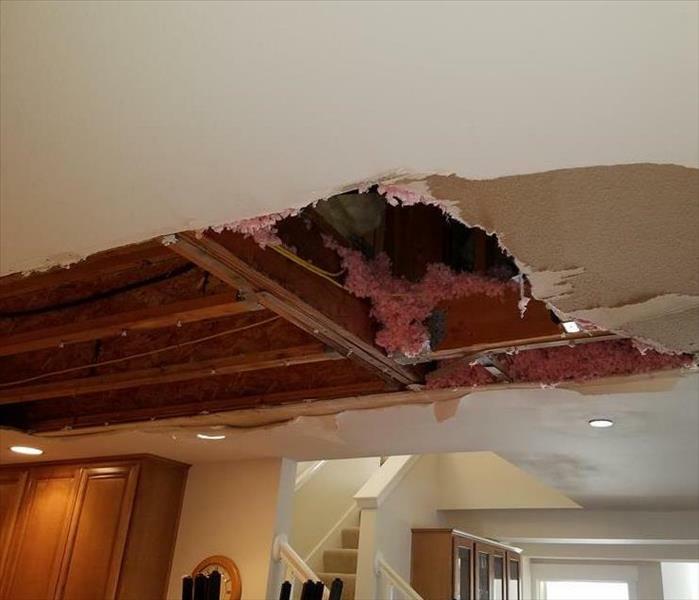 With the water damaging the ceiling and causing it to collapse and fall, it created a bit more of a issue than they were anticipating an overflowed toilet to do. But we were able to come right away and help get them cleaned up, dried out and back up and running in no time. Kitsap County, and west Washington in general is known to be a bit more of a wet area of the U.S. so we do occasionally get some storms, but we had one major storm that caused a bit more damage than appreciated. Due to a high wind in our last storm, a fallen tree punctured straight through the roof causing water damage inside the home. 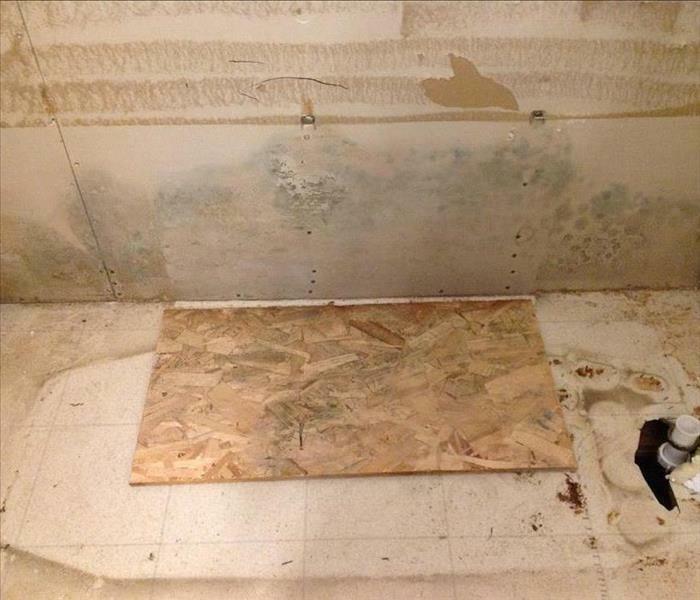 Mold can start growing within 72 hours after water damage has happened. And depending on the environment and situation, even sooner. Water and mold are not things that should be taken lightly, they take more than a few spritz' of cleaning solution, towels and a mop to clean it up. 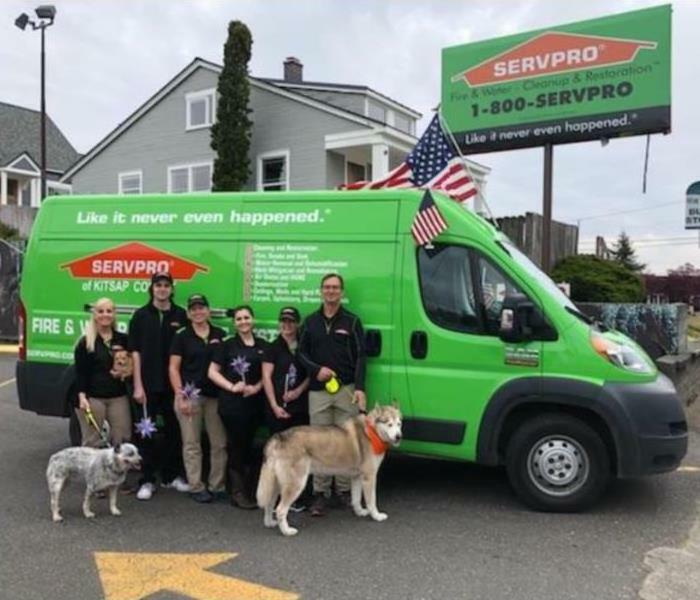 Call SERVPRO of Kitsap County to come out and help you make your home or business "Like it never even happened." because we are always here to help. You would never imagine how much damage an overflowed toilet can cause unless you have gone through the loss and fully seen the ramifications of that. 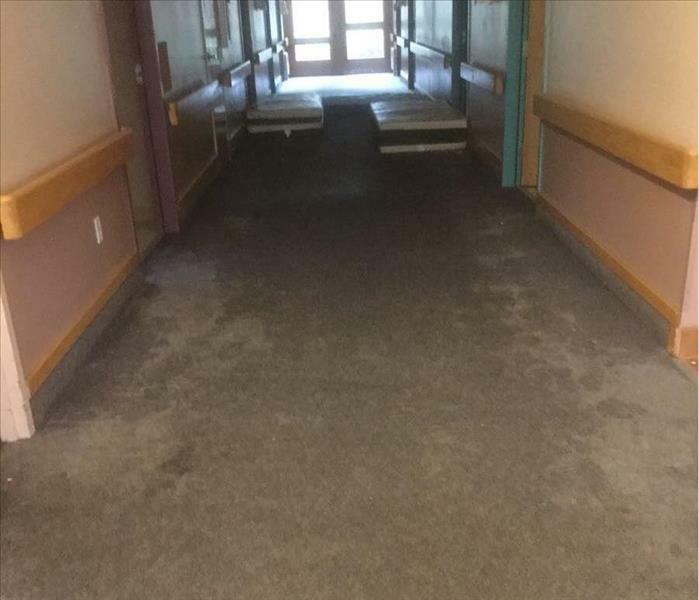 The water saturates not only the bathroom but overflows into the hallways and surrounding rooms, causing damage to either the vinyl, carper or hardwood. Call your local SERVPRO Franchise Professionals to come out as fast as possible so we can help dry out the affected areas. Washington is known to be a bit more of a wet area of the U.S. so we do occasionally get some storms that cause a bit more damage with the wind, rain, snow and especially, the hail. 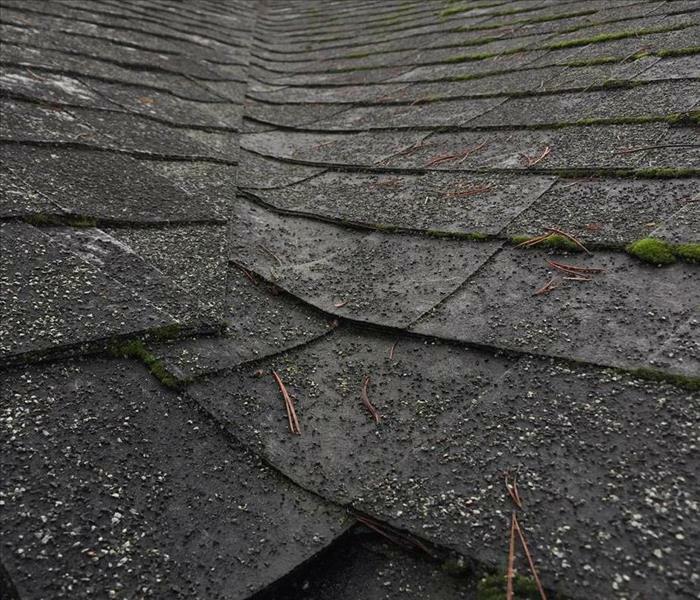 This photo shows the aftermath from a hail storm that damaged the exterior surface of the roof causing water damage inside the home. We get our fair share of both residential and commercial losses and give both the same amount of dedicated time and efforts needed to each job to make it "Like it never even happened." Insulation, especially fiberglass, is Molds best friend in a sense. Having the ability to retain moisture, have air spaces, may contain organic materials such as dust, being in a darker environment and being something to actually hold onto, mold is able to grow and spread more than anything. If you have any sign of mold, get it checked out and remediated before it spreads and causes more damage. What happens when you have an enclosed area that has frequent moisture occurring, a high amount of humidity often, with bad air circulation? The answer is clear; MOLD. Your local SERVPRO Franchise Professionals are here to help get that mold out of sight and out of mind by remediation and cleaning the spores up to be gone. Hardwood floors are great and look good too. That's why a lot of us get sad to see hard wood flooring damaged by water. It causes the wood to expand, shift and buckle. 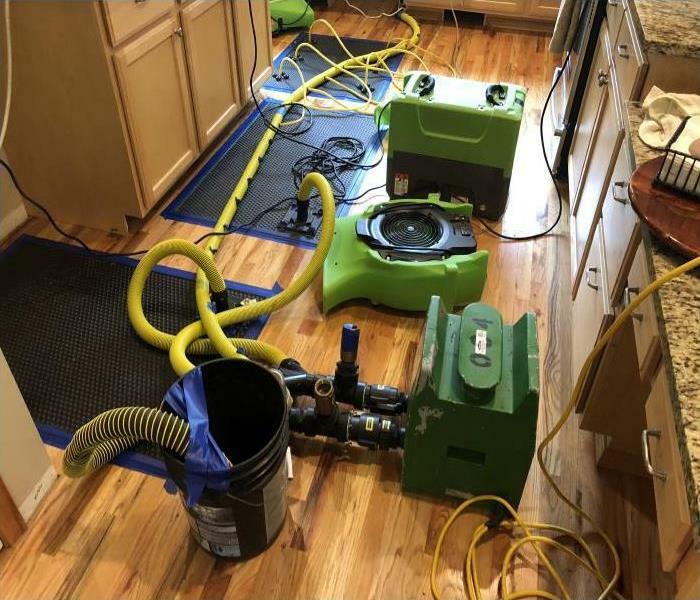 But Thankfully your friendly local SERVPRO Franchise Professionals know how to get them out as best as possible so we can dry out the water saturation, before letting your new hardwood floors be laid down. We pride ourselves in being the best service out there. And when not only residential losses occur, but commercial losses happen, we are happy to help get those businesses back on their feet so they can open their doors to the public again as soon as possible. 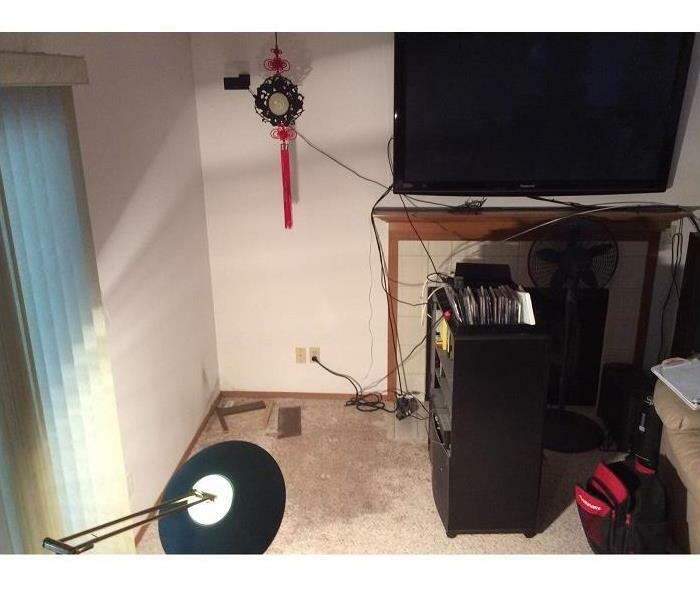 Water damage is a complex loss. It can weaken wood and affect its structural integrity. 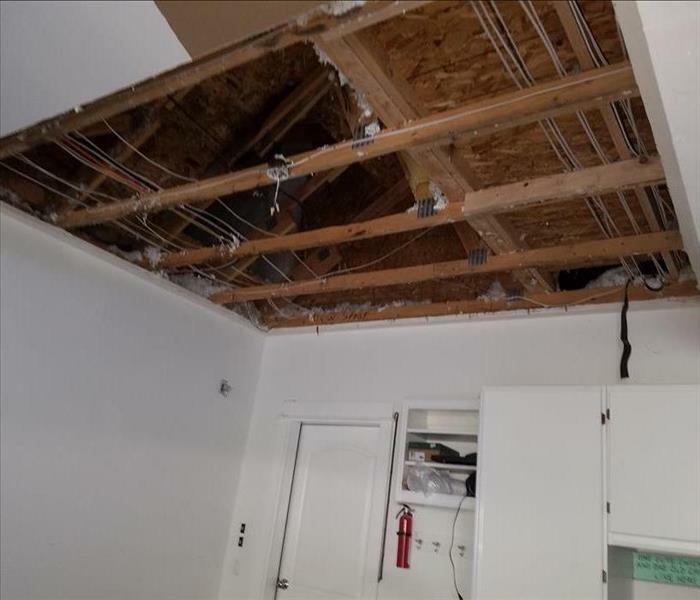 Our team members were definitely up to the task when we found out that the water damage had caused the ceiling to collapse in. Thankfully, no one was harmed. Mold can be a dangerous and harmful entity that no one wants to have in their home. It causes health issues and structural damage that it has attached itself to and affected. 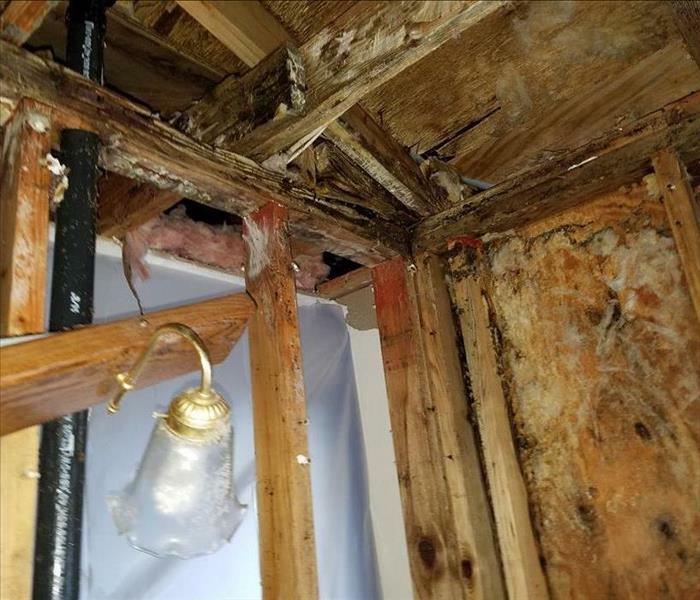 This was one of the many mold jobs that we have come across, but we were able to come in and use remediation to clean up this largely affected home. 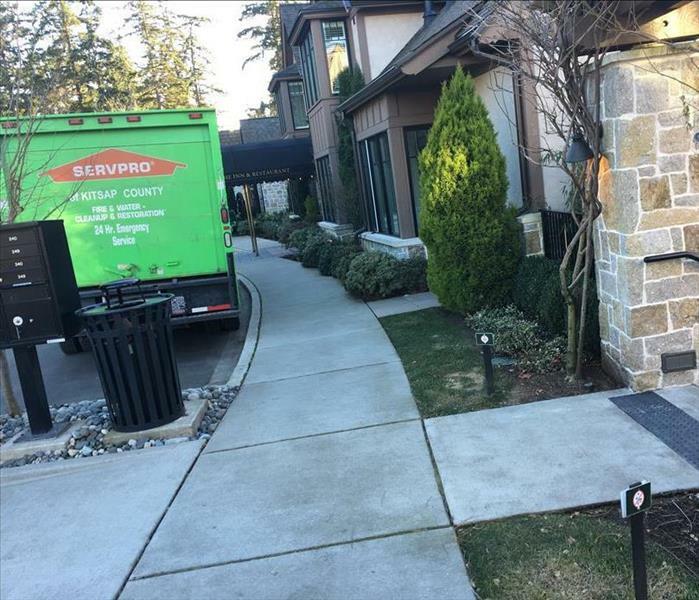 SERVPRO of Kitsap County handles residential and commercial losses, no loss is too small or too big for our crew. 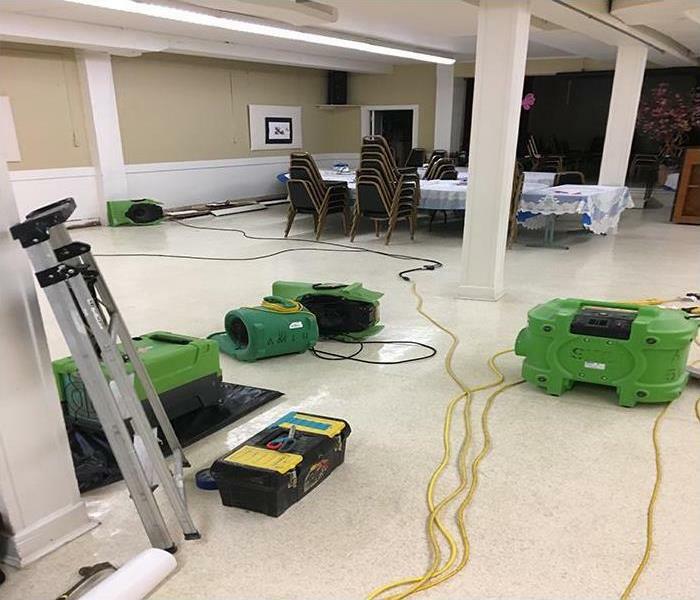 We recently had a job of a water damage loss to a manufacturing company's main office, we were on the scene promptly and got straight to drying out and restoring the professional work environment. No matter the job, our SERVPRO Franchise Professionals assess every job situation in an optimistic light, and are always prepared with the necessary tools, equipment and attire. 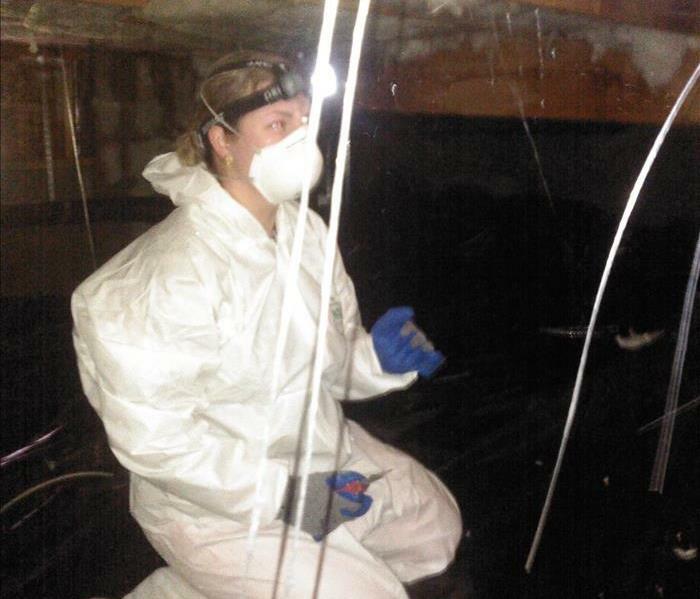 Be it for a mold infestation, water or fire loss or a bio-hazard cleanup, our SERVPRO technicians remain professional while getting ready in the correct protective gear before getting into the dirtier sides of the job cleanup, mitigation and restoration. SERVPRO truly enjoys participating in community events. We set up a booth at the West Sound Business Expo. Including setting up an information area with brochures about the different services we provide as well the different disinfectants that we use on job sites. We brought a slideshow of different jobs we have done and also showed our latest commercial before we release it to local TV stations. SERVPRO loves participating in community events. We set up a booth at the Winter Peninsula Home and Garden show annually. We set up an information area with brochures about the different services we provide as well the different disinfectants that we use on job sites. In the past we also have set up slideshows of work we have done as well as fun handouts for the kids. A job in the restoration industry is not for everyone. It takes a special kind of person to be deal with the sort of disasters we see on a day in day out basis. 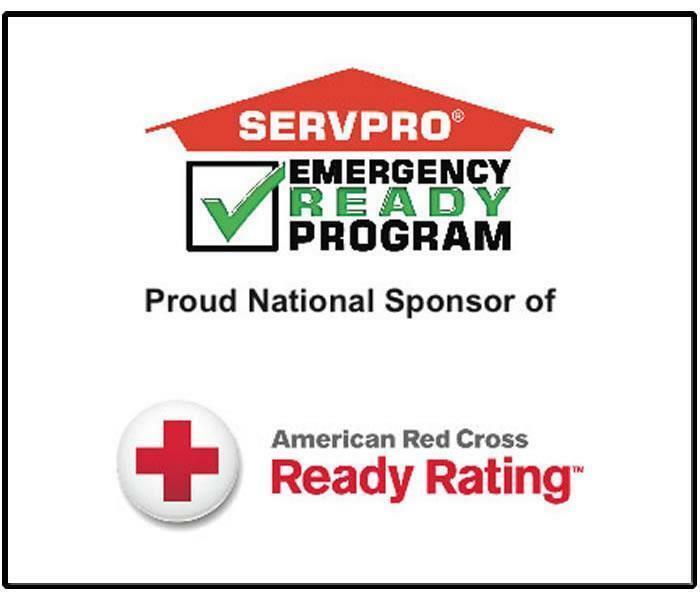 SERVPRO holds an annual golf tournament to raise money for our partners, The American Red Cross. Our crew has an awesome time playing a round of golf for a great cause! SERVPRO really loves participating in community events such as the Armed Forces Day Parade in Bremerton. The parade gets bigger each year and is always a blast to be apart of. Fire damage is without a doubt devastating. With every fire comes a momentary spark of uncertainty. 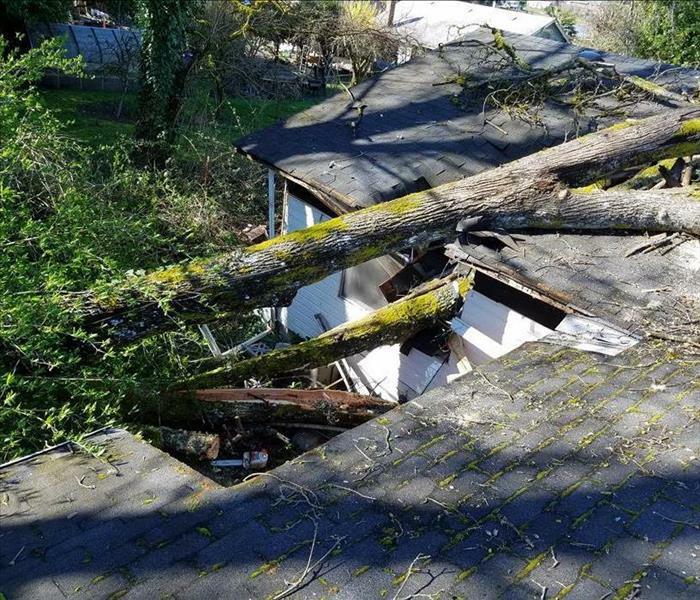 SERVPRO professionals pride themselves in the restoration work they do for the home owners that deal with these losses around Kitsap County. No matter the size of the loss, SERVPRO professionals are able to help. With Large Loss Response teams located all over the Nation, SERVPRO franchises have the capability to team up and conquer any size loss. Nobody plans for a disaster to take place in their home or business. However taking a couple of steps to prepare by having an Emergency Ready Profile done at your home or local business is great in minimizing the damage done. Call (360)373-1290 for more information on this great tool. Through the SERVPRO scramble, we were able to present The American Red Cross with a check of almost $6,500. 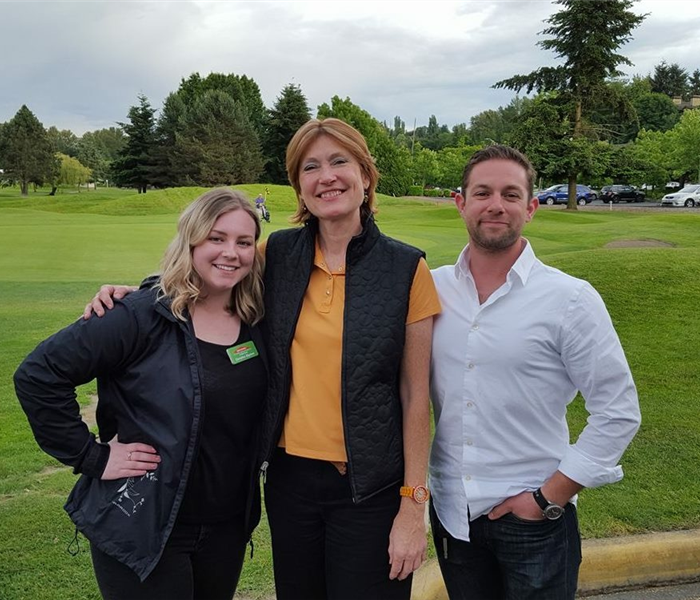 Pictured above is (from left to right) SERVPRO marketing representative Christina Bigelow, The American Red Cross representative Bonnie Bush, and volunteer Dylan Myers. No matter the job, SERVPRO professionals try to look at every situation in a positive manner. 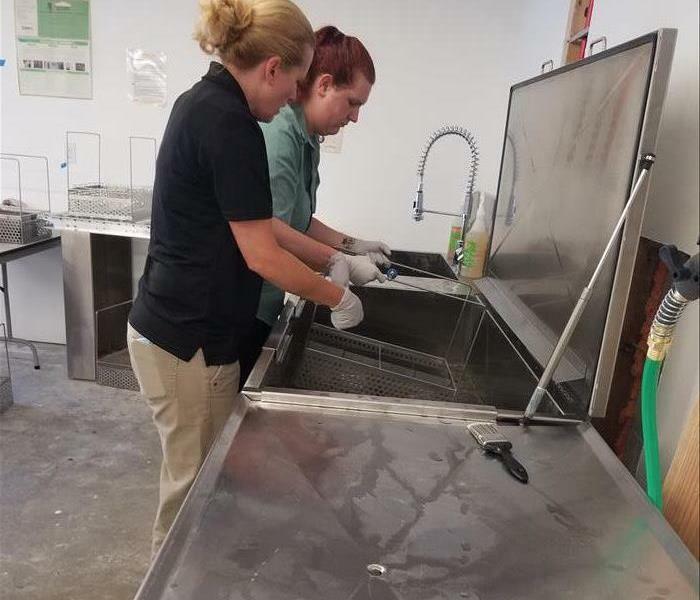 Whether it's a "typical" water loss, a devastating house fire or a biohazard cleanup, SERVPRO employees remain professional and optimistic. Using a commercials fogger can be helpful for a variety of situations. 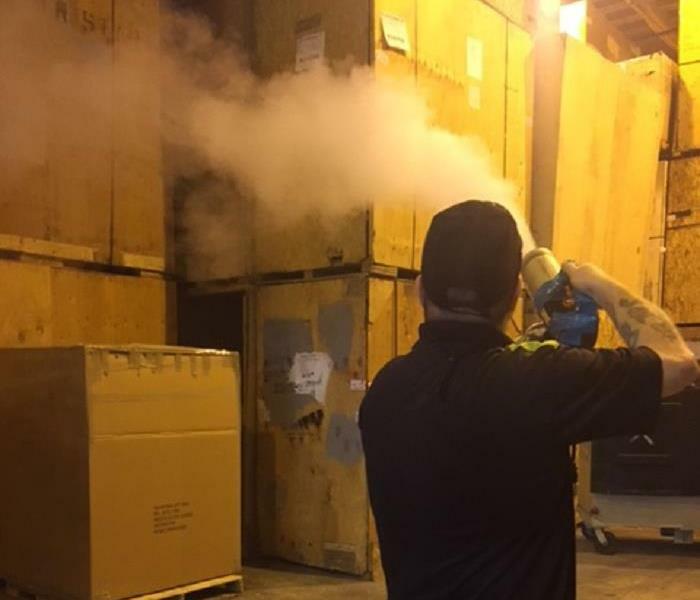 In this instance, you can see our technicians fogging an industrial-type garage after there was a small fire inside. The fog will help eliminate any lingering odors from the fire and help restore things to their original condition. After a fire, not everything is left charcoaled. Lots of times soot is all over the walls, ceiling and furniture. SERVPRO professionals often times use "Firestar" a hospital-grade disinfectant to clean the parts of the home or business that were affected by the soot. 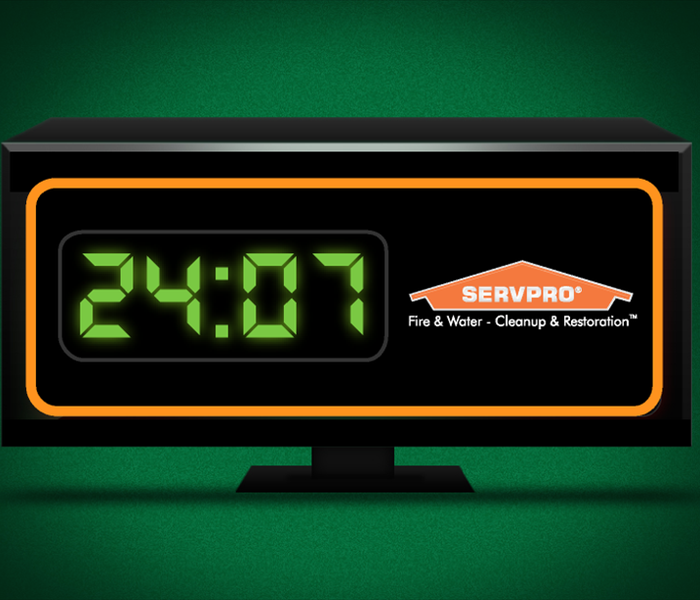 SERVPRO really take pride in our quick response times. When faced with a disaster, SERVPRO allows you to call us anytime-day or night-and we will respond within 4 hours of receiving your call. 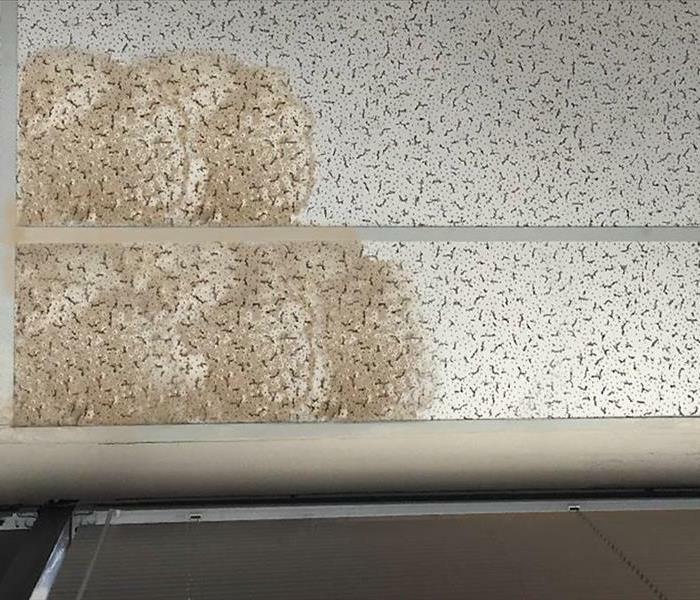 It's important that if you see the start of a leak, or water spot on your ceiling tiles for example, that you get things checked out immediately. Small scale problems may seem minor, but can lead to a larger problem down the road.